Most days I feel like I'm a strange man in a strange land especially since I'm a Texan wearing a skirt for the entire length of the west coast. We've made the coastal turn to the SoCal Bight somewhere around Point Conception, it's an inflection point - a concavity actually, that naturally delineates between central and Southern California. But it's more than that. It's the point at which the cold coastal waters start to warm and the tides begin to downwell. Too warm for the sweet succulent Dungeness crab. The mid afternoon fog banks that roll in almost on schedule to cool us down no more. Where the sun hovers over the Pacific Ocean all day long and days like today which confuses the hell outta me since there's gotta be shade at some point throughout the day. I mean - 'rise in the east set in the west' thing I once learned. The turn also marks the final descent to our seventh month west coast walk. I write this from our tent, technically in Malibu but only a mile or so south of Neptune's net where I had my thanksgiving meal - a disastrous tale for another time. Heck I'm just thankful that we made it this far alive. I recently met a cyclist who travelled most of what we just did save 20 to Newport OR, 154 into SB & a few other crazy dangerous stretches & he said what the hell were you thinking? Well, we just gotta get to LA was my answer. Isn't that the crux of the west coast? The hub of the hubbub out here? We're almost there - mere days away. Keep hoping Ellen is there to greet us. Or at least the kardashians aren't cuz we're too tired to turn back. YBD's Notes: I put the last paragraph in there to, in my own way, thank everyone who've tried to get us on the Ellen Show. As I have learned along the way 'Les chiens ne font pas des chats'. Indiana and I are back on the road from my brief jaunt up to the northeast to honor my yearly commitment to the folks who make Puppy Up the most successful grass roots organization evah! Madison CT won the contest last year and their 2014 walk was even bigger and badder, a trend they've been setting every year. From over 300 in 2012 to 600 walkers this year Valerie and her team did an incredible job and it was inspiring to be there although I like to joke that I brought the sunny 70 weather from the west coast. We also timed it so I could attend the inaugural Puppy Up walk at HOPE Veterinary Specialists in Malvern PA the week prior and damn glad we did. Despite the rainy frigid weather, droves of Phillyers? (Whats the proper demonym?) showed up for the walk and to celebrate the clinic's 10 year anniversary. Cheers to Kate Craig and Dennis! Powerful the day's events but perhaps the most poignant moment for me was meeting two of the patients in a study we funded. Teddy and Bynx. 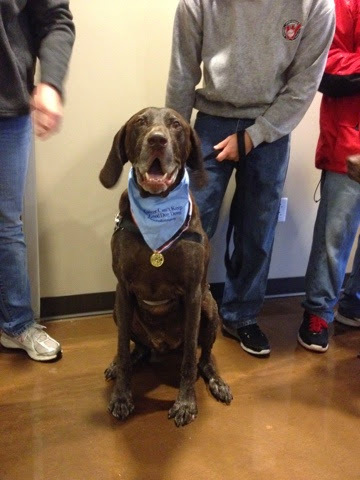 They have a particularly nasty inoperable bladder tumor and both were given a prognosis of 1-2 months. The Animal Medical Center in Manhattan is working on a more effective delivery system to get chemo to the tumor site and early results are promising. Teddy and Bynx have passed the one year survival mark because of this study and if it continues as hoped, Sloan Kettering will start human trials. Folks this is the crux of comparative oncology. You can learn more about the types of studies The Puppy Up Foundation funds here. 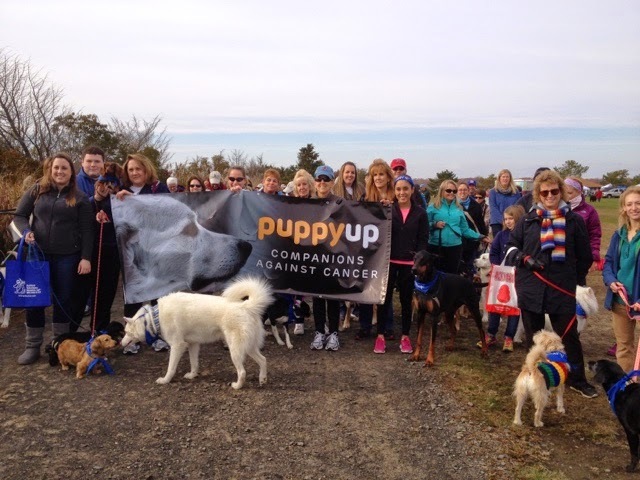 After enduring hurricane Sandy, Puppy Up NJ has had to change venues more times than Gov Christie has redirected traffic off the GW. Just like the boardwalk, our dear Jude has weathered some storms but she's still standing strong and this years event was held at Dusty's Dog House and I'm grateful I had the opportunity to be a part of their walk this year. FYI Jude - next time please don't cry when introducing me cause there's nothing worse than a dude wearing a skirt gettin all weepy. It's sometimes hard to get perspective when youre deep down in it, risking all you have for a cause. And the west coast walk has put us to the mat many many times so a Puppy Up break was sorely needed. I recently read that last year $18.5 billion was doled out by the federal government for renewable energy subsidies and recently $6.2 billion has been earmarked for the 'Ebola crisis'. The total budget of the National Cancer Institute in 2014 was roughly $5 billion, which has remained at that level for over a decade. Last time I checked - 1/2 of all men and 1/3 of all women will develop cancer in their lifetime never mind the 2-4 million dogs each year. Talk about a government so disconnected and resolutely unconcerned with the most immediate threat facing its population. Some mornings I just wake up shaking my head asking why? Why get out of your tent and keep going? I could tell you why I do but being a part of the Puppy Up walks says everything I need to say. Have to give a shout out to Madison WI because Beth and Kai had the most awesome walk May this year and the perfect send off to our west coast walk. Thank you for the boots and I'll see you next year.